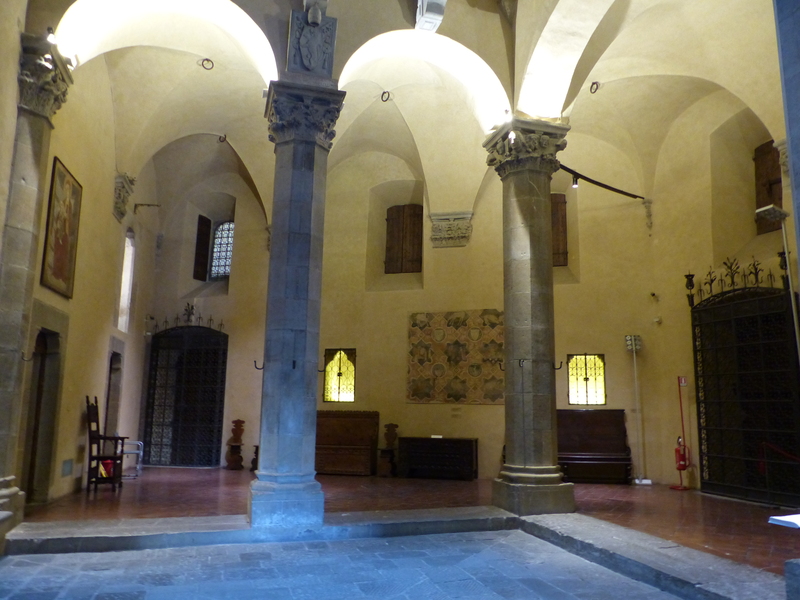 The Firenze Finale – Run. Ride. Roam. Our final day in Florence, before pedalling on. 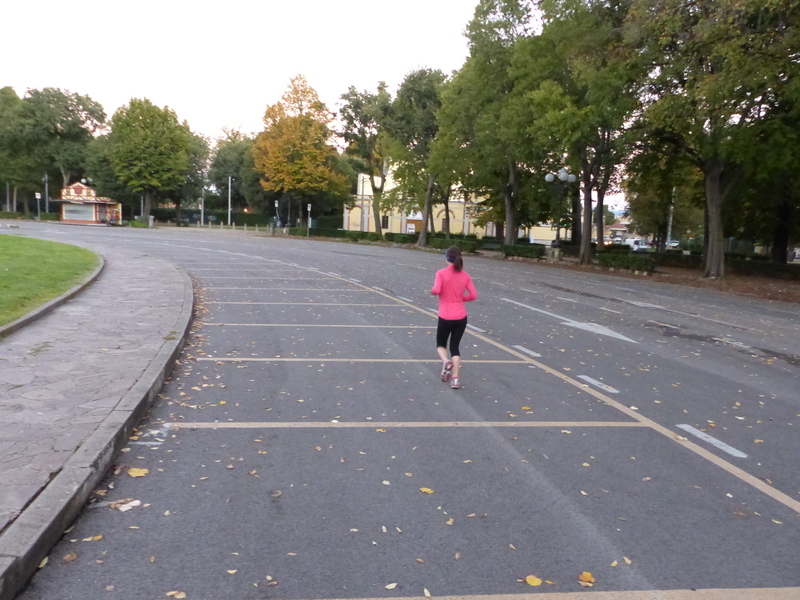 I couldn’t leave this city without going for a run, so this morning, as soon as it was light, we set off towards the nice big park we had ridden through when we first arrived. Steve came with me on the bike, to guide me through the streets, which was super nice of him because he is so not a morning person. Then when we got to the park, I ran along the paths and through the trees and it was wonderful. It felt so good, I could have just run and run and run all day. I passed other runners who gave a smile and a wave and a “Ciao” and it was a super start to the day. After some brekkie, we set off to the see the city for the last time. 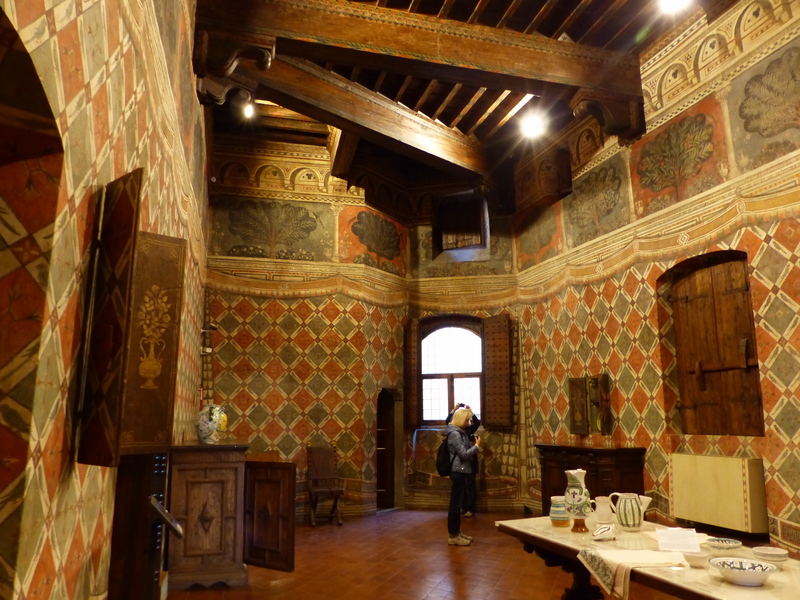 First stop was to visit Palazzo Davanzati, a grand 14th century mansion that was home to the Davizzi, an important family of merchants and in 1578 was bought by Bernardo Davanzati, another successful merchant. The house is now a museum and is set up to show how a wealthy family, such as those who had owned it centuries ago, would have lived. It was such an interesting place to visit and was another occasion where I think I left with a crick in my neck from looking up all the time! 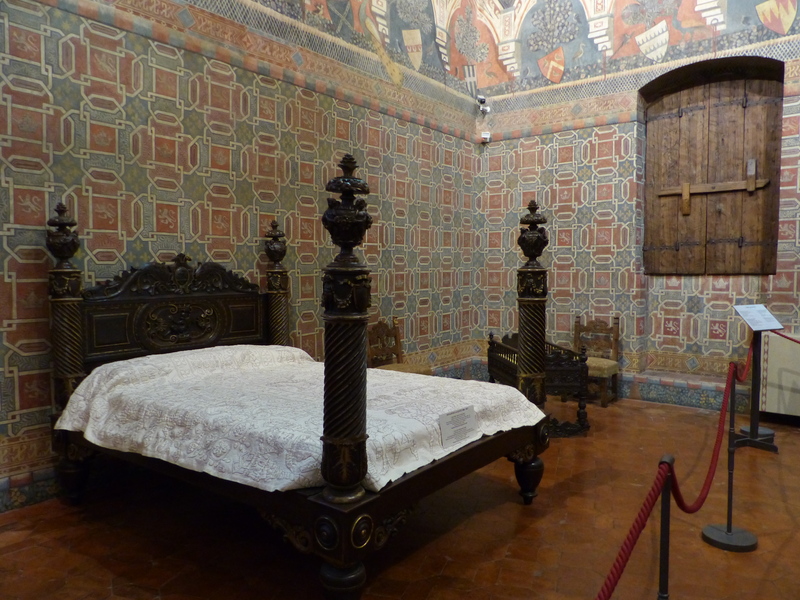 The ceilings were high and ornate, the rooms large and beautiful, with painted walls and gorgeous furniture. There were also items on display, that would have been used by the family, such as a collection of 15th century pottery. 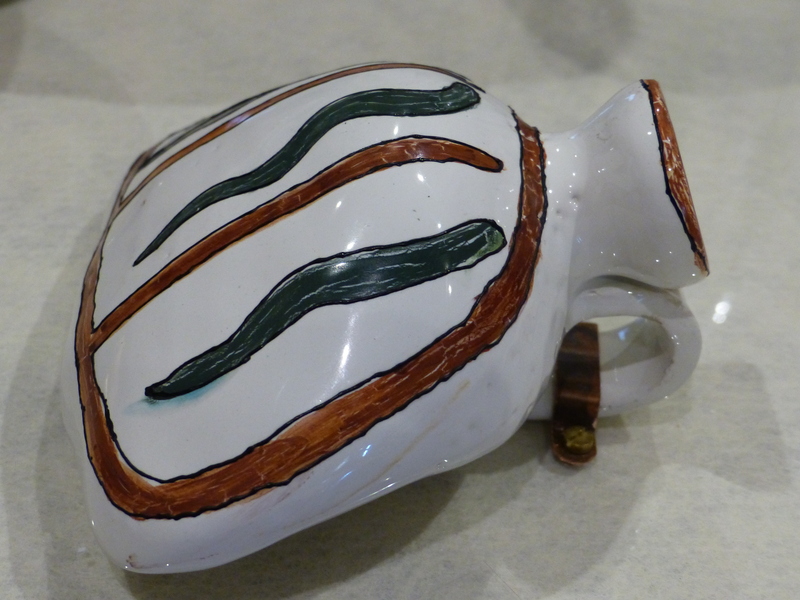 Something for me…a 15th century pottery hand warmer! One item I loved, was a folding chair. I looked at it for ages, trying to work out how it folded. It clearly collapsed with the seat folding down, because of the crease in the cushion, but I sat and squatted and looked this way and that to see how the heavy wooden frame moved, so as to fold the chair. It was really quite an ingenious design for something so big and ornate. 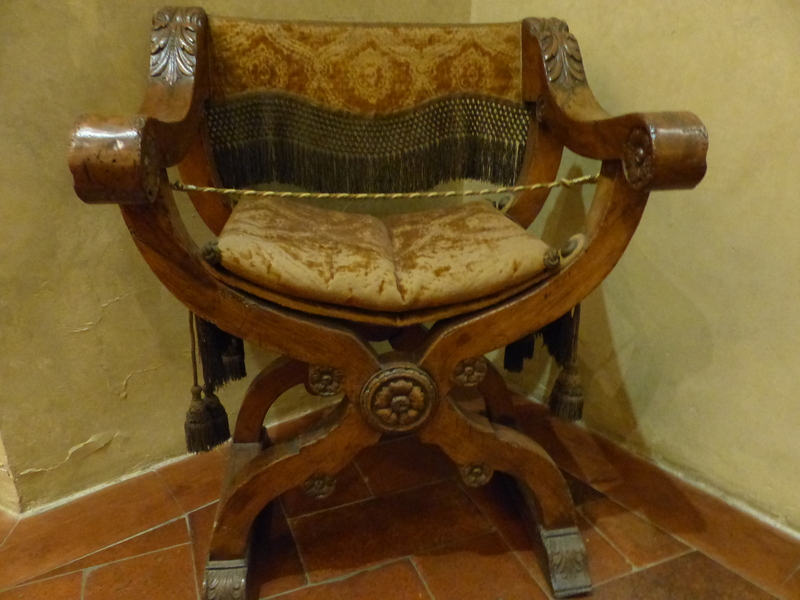 I would never have thought that folding chairs would have been the go in the 15th century, but another lesson learned! I’d like to see this one thrown in the back of the car to take on a 21st century picnic or camping trip! After taking our time to explore the Palazzo, we returned to the street, where the sun had come out and was warming things up nicely. Time for elevenses. 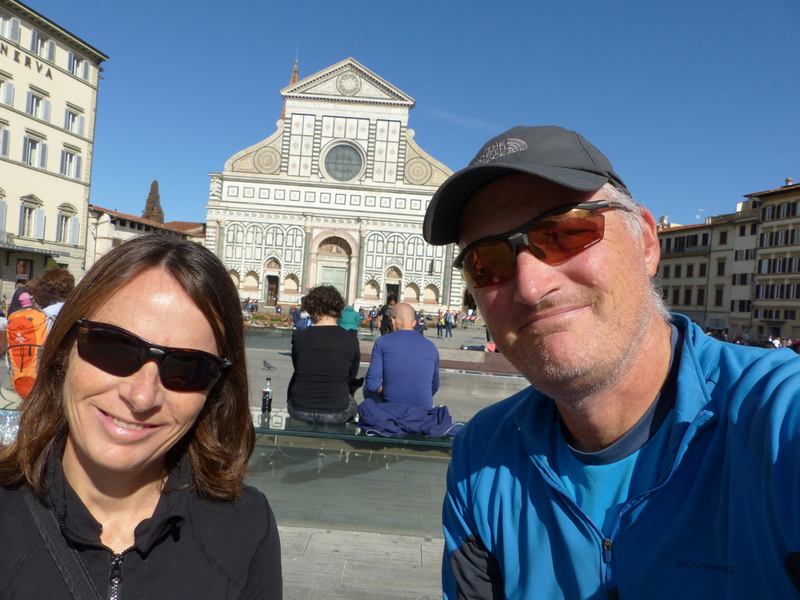 We found a nice spot in the sun, in the Piazza di Santa Maria Novella and had our snack, with our pigeon friends, in front of the beautiful building, while reflecting on the things we’d seen and our impressions of Firenze. 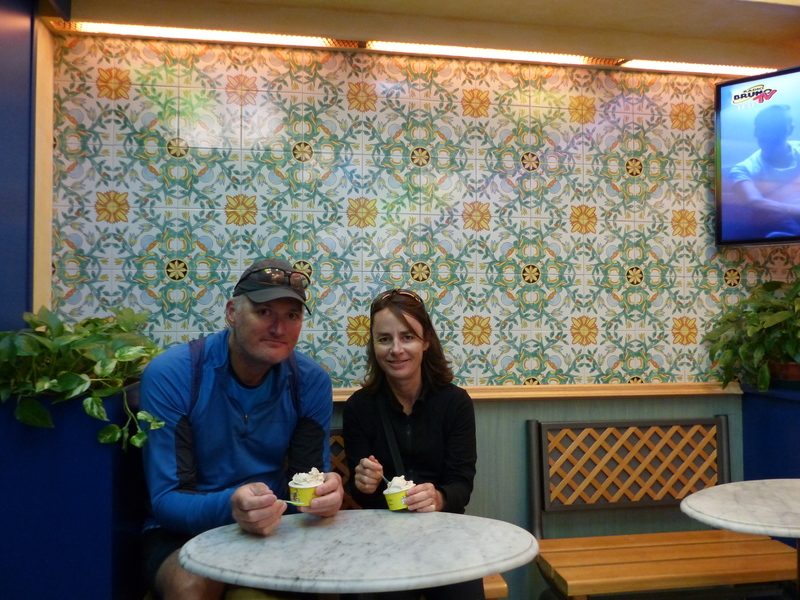 After elevenses, we decided today was the day for gelato, so we strolled to a gelateria, that had some dairy free flavours on offer, made from rice milk, so we enjoyed a little cup of the famous Italian ice-cream, as a treat for the day. It was very nice! When we arrived in Florence, we had walked through the Piazza della Signoria, which is the main square in Florence, but we hadn’t been back to have a proper look at it, so we did that today. We took our time to look at the statues, which were huge and impressive and it reminded me that I really need to brush up on my mythology! 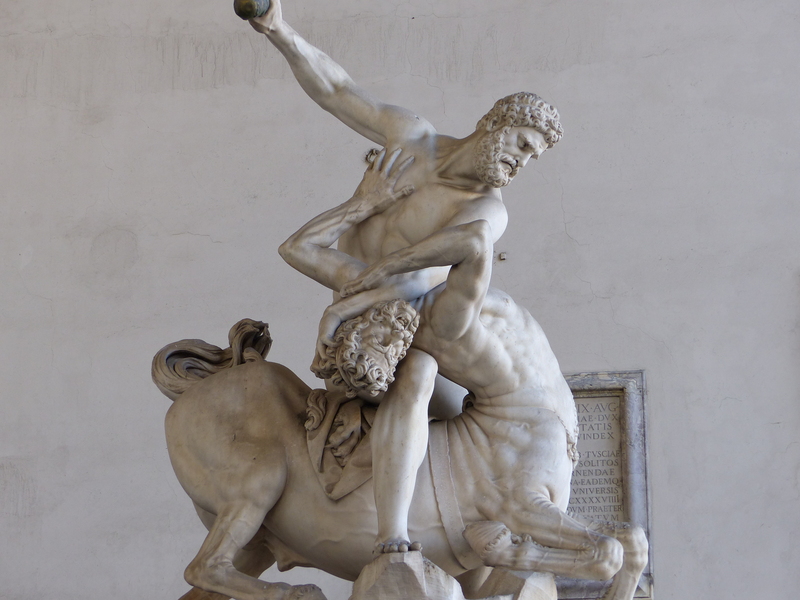 I see names of figures, which I recognise, such as Perseus, but can’t remember the stories attached to them or the event being represented by the statues. I’d better start some extra reading I think. 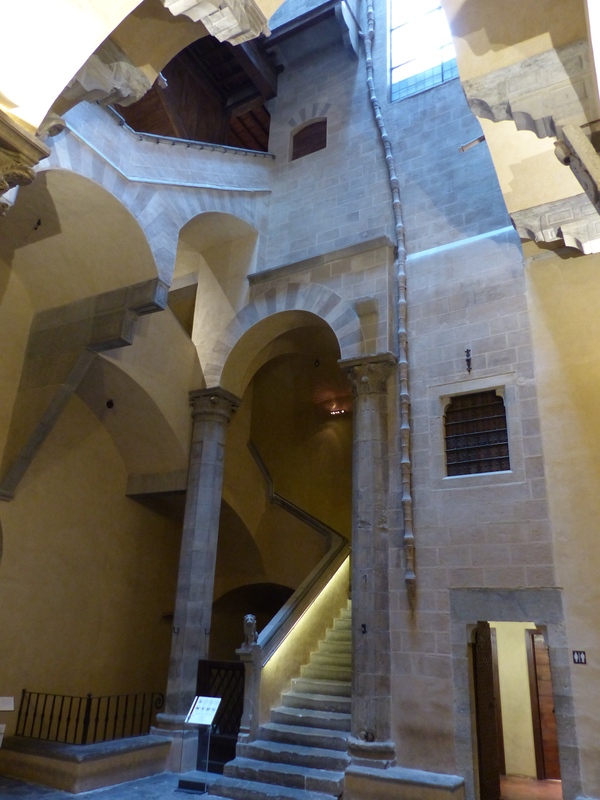 Next was a stroll through the courtyard of Palazzo Vecchio, another grand palace that overlooks the square. It was another beautiful building with a beautiful interior. The places we have seen have all been so beautiful and so well cared for, respected and preserved. I couldn’t help but see the contrast with Venice, which was such an amazing city, but struck us as being so run down, with so much looking like it needed care or restoration, or just some TLC (and a coat of paint to get rid of the spray paint everywhere). Florence is quite different. The buildings are authentic and historic and ancient, but have been preserved so well in their original state and original locations. It’s been so amazing to walk down 13th century streets, see 14th century buildings and walk through 15th century houses, all there for us to see and no doubt, will still be there for generations to see, because of how they have been looked after. It’s just been a wonderful, wonderful experience. Interestingly, Steve was reading the website of a very well know travel writer today, who described Florence as “beautiful” and Venice as “decaying”, so I guess we aren’t the only ones with that impression. We wandered, in a very leisurely fashion, back to our little apartment, where we began to get our plans sorted, ready to ride on to our next destination. 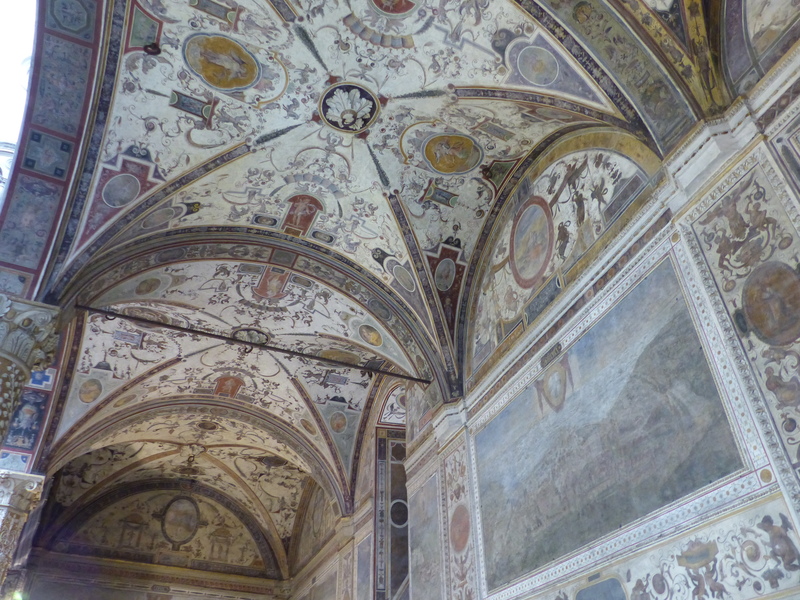 We managed to see some new things today and visit new places, which were all memorable experiences, which made it a grand hurrah from Firenze. Oh, today was also my birthday. Steve turned forty-five in Paris and today I turned forty-five in Florence, which I think was equally special. Steve’s birthday wish had been pizza and beer, which he had in Paris. My request was toast and peanut butter and a cup of tea, which I also had. I hadn’t had peanut butter since England and since our little apartment came equipped with a toaster, we managed to track down some peanut butter, so I thoroughly enjoyed my toast with peanut butter and jam and declared it “heaven on a plate”! I’d hoped for real tea, in a pot, with tea leaves, but I knew that was stretching the dream too far, since that’s been hard to come by anywhere on this trip, so I enjoyed my tea bag in a cup, which was the next best thing and was the perfect accompaniment to the PBJ toast. Those simple pleasures! I had a lovely day and a special birthday. I had a fantastic early morning run through the park, a birthday wish of toast with peanut butter and tea, a delightful stroll in the sun through this amazing city, elevenses in a piazza in the sunshine and a visit to a grand house. I even had a rare treat, with some ice-cream! A very special day. Tomorrow we move on, discovering new places and seeing new things. 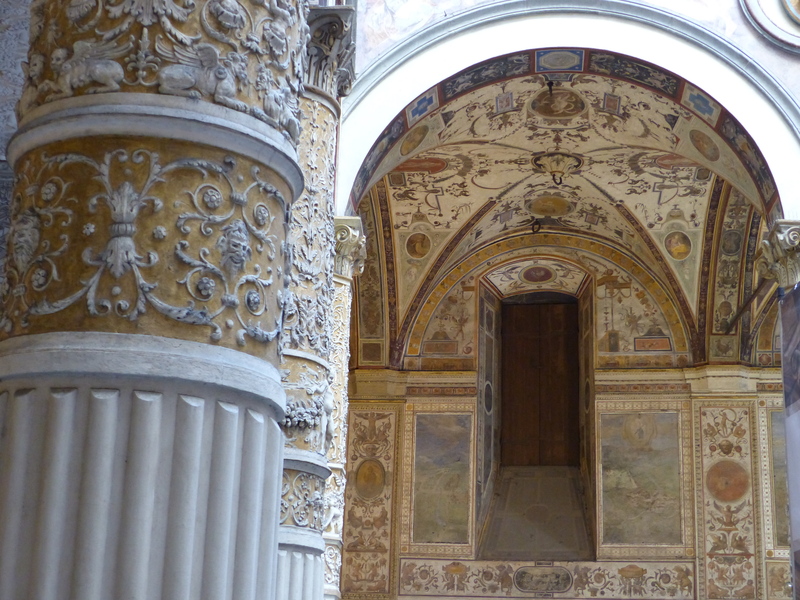 Whatever we find, we’ll always have Florence, which held us in its spell and will remain a wonderful highlight. What am I saying, everything is some sort of highlight on a trip such as this, with the new and amazing things we experience every day. Even the tough bits are all part of the experience and give the story their own brand of highlight! Some highlights, like Florence, just shine a little brighter than others! So, tomorrow will deliver something, we don’t know what and we don’t know where, but..let it shine, let it shine, let iiiiiiit shiiiiiiiiinnne!!! Happy birthday Heidi from Julia Kramer. I was just talking to Gennie Gleeson and she told me about your adventure.. What an exciting thing to do and such an authentic way to experience the areas you travel through… With time to observe more closely, smell the atmosphere and feel all of the elements fully. Enjoy! Hi Julia! Thank you for the birthday wish. Yes, “slow travel” certainly is the way to see things and we’ve been able to go to places and see things on the bikes, that we never would have if we’d been in a car. It can be slow and it can be hard at times, but it’s a great way to see and experience things for sure! Thank you for stopping by the blog! Heidi, what a special birthday in so many ways. Happy Birthday!